Over the course of their 30+ plus year career, the critically acclaimed iconic Sacramento melodic hard rock quintet—Frank Hannon [guitar], Brian Wheat [bass], Jeff Keith [lead vocals], Troy Luccketta [drums], and Dave Rude [guitar]—have sold more than 25 million albums and performed to sold-out crowds across the world. Since the 2016 release of their album, Mechanical Resonance Live! 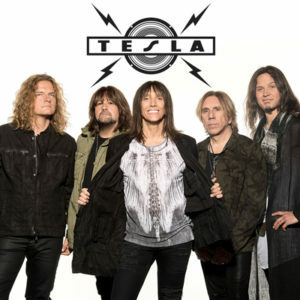 which features a brand-new track “Save That Goodness” produced by Phil Collen of Def Leppard, TESLA has been touring nonstop. They have shared stages with STYX, Deep Purple, Cheap Trick, Joan Jett, REO Speedwagon and have performed headline shows the past two years consistently. Their recent tours have further solidified TESLA as a live concert Tour de Force. Developing their already high energy show into a modern production, the band has added multimedia visual screens to enhance the concert performance. “The visual enhancement is a new thing for us and it’s made the band really play a tighter show. One of the songs, “What You Give” has a photo montage that shows us as youngsters and the fans have really enjoyed that!” says guitarist Frank Hannon. In order to fully celebrate their 30-year plus history, TESLA not only performs their radio hits but also includes a stripped-down acoustic set of “5 Man Acoustic Jam,” which was the bands biggest selling album that spawned the unplugged trend of the 1990s. The road crew seamlessly strips the stage to reflect the intimate vibe of the guys acoustic set. This includes a piano rendition of the song “Paradise,” which has become a favorite of the die-hard TESLA fan.